Continues up to the high country and permits better access to San Isidoro and the trail to Mision San Pedro Martir, in 2 places. Then continues southeast along the base of the Sierra San Miguel, which is really part of the entire San Pedro Martir range, to meet the road coming up from El Socorro or Los Martires to El Rosarito and El Suerte. 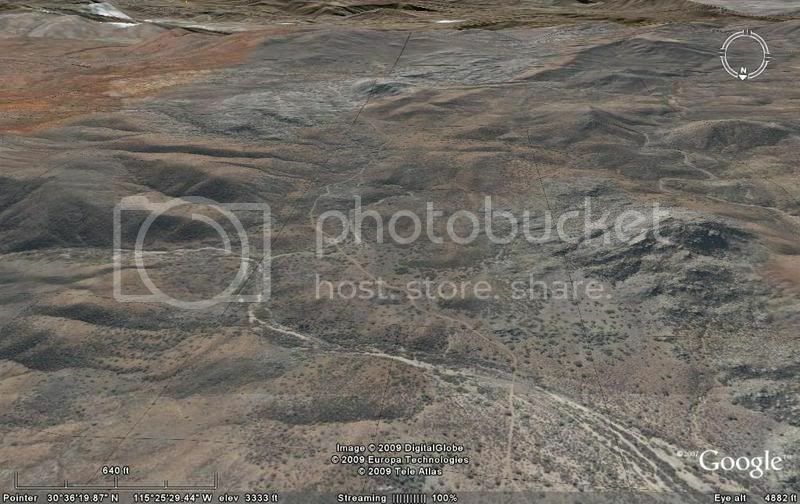 A new cut across road goes to the El Morro mine area, as well. 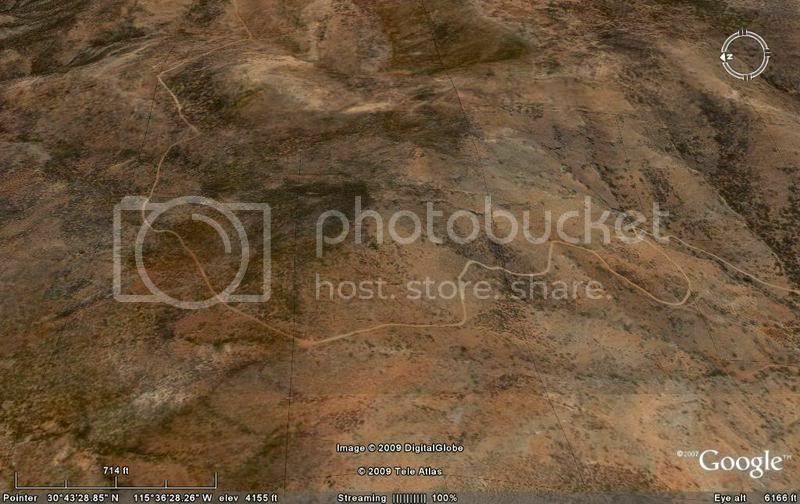 Here is the new road area... the arrows show where I have saved a satellite image, below. I believe the Baja 1000 ran this way at least once to get south without using highways... reaches Hwy. 1 east of El Rosario at Los Martires/ Arenoso. Interesting--you DO have alot of time on your hands! I vaguely recollect this road being there in 2004 and thinking the access to the mission might have been easier from there--it might be on my old topo map. I think there was also an old road going into Rancho San Antonio but it was pretty well washed out. 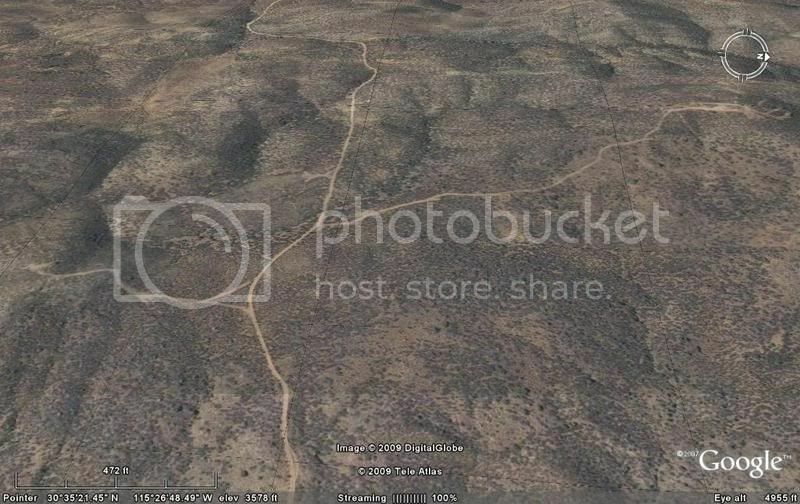 How does this road connect up with Rancho La Suerte? 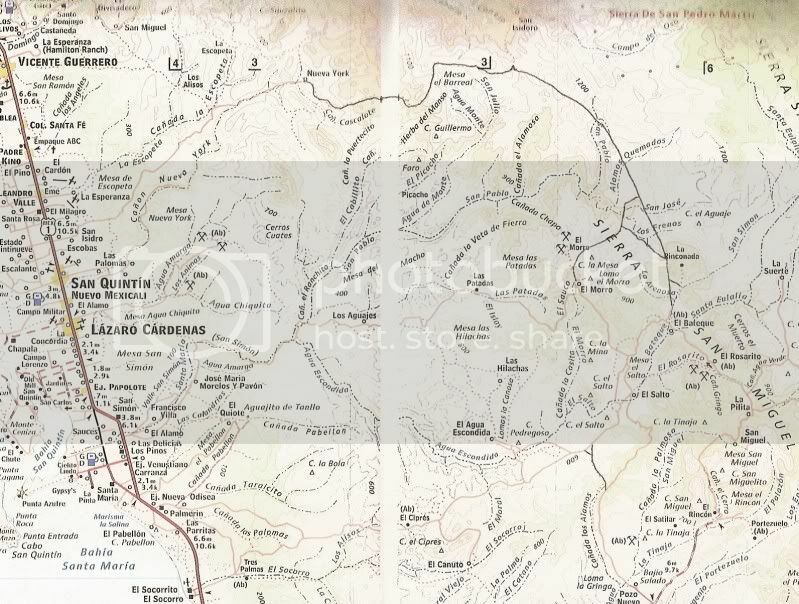 Maybe you have to head south to the El Salto or Rosarito and then go back north to La Suerte. Sorry for the editing --I keep getting R. San Antonio and San Isidoro mixed up...see what happens when you stay away too long! 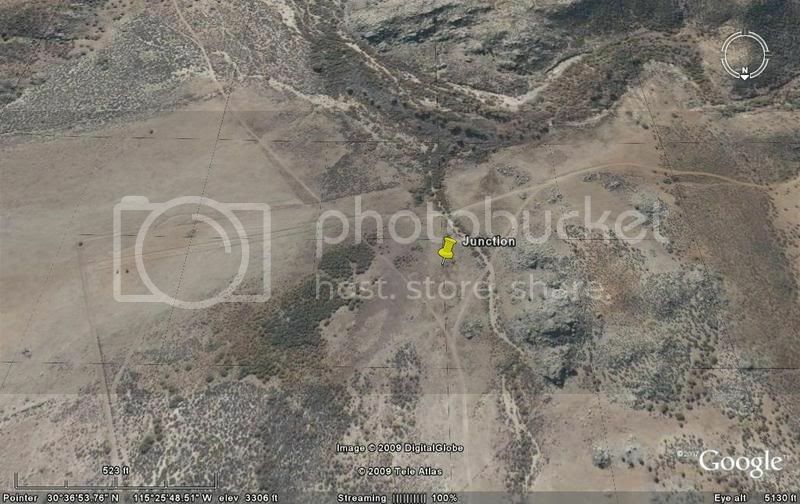 El Suerte is just off that map, east of El Rosarito. 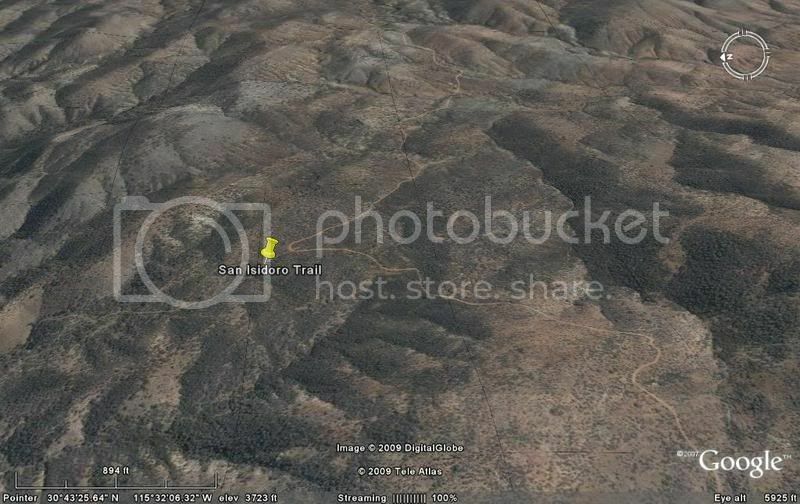 See the new post about the SPM Mission trail, on the Nomad Hiking and Backpacking forum... I have a question for you about your trip. 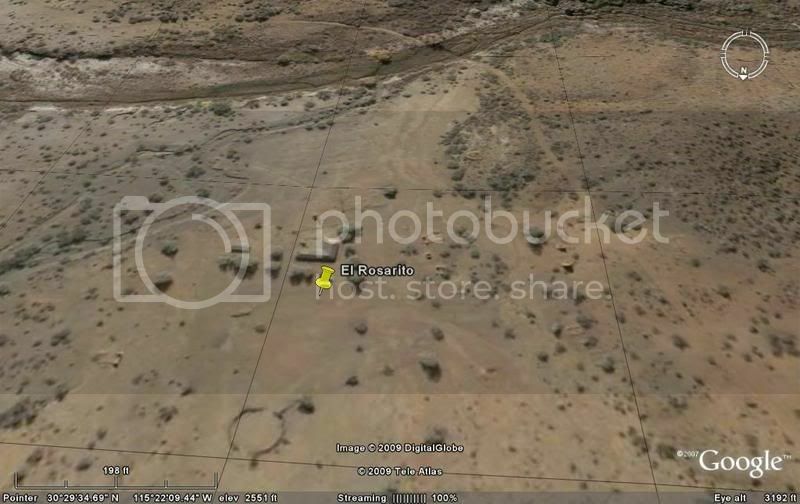 Rats, can't find the topo...looks like great exploring though! 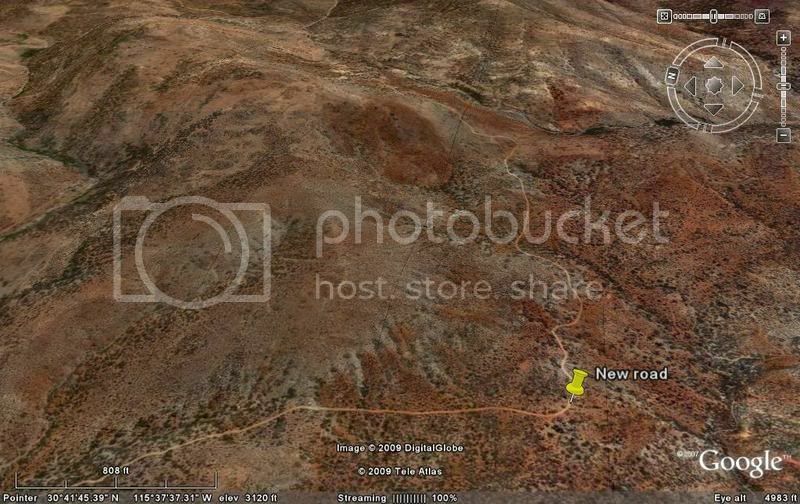 That country, especially south, seems to always have new roads cut into it by the Yucca harvesters. In the 80s there were new roads put in by the government for ranching too, I think. 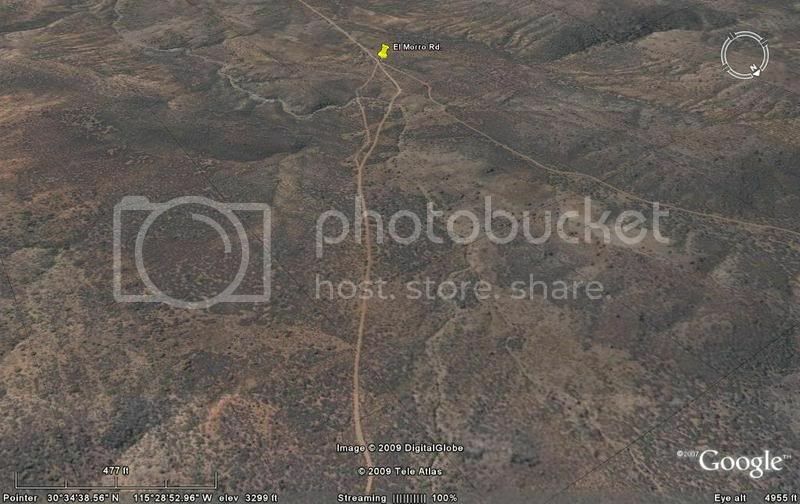 Check u2u and see my SPM mission trail from space post. 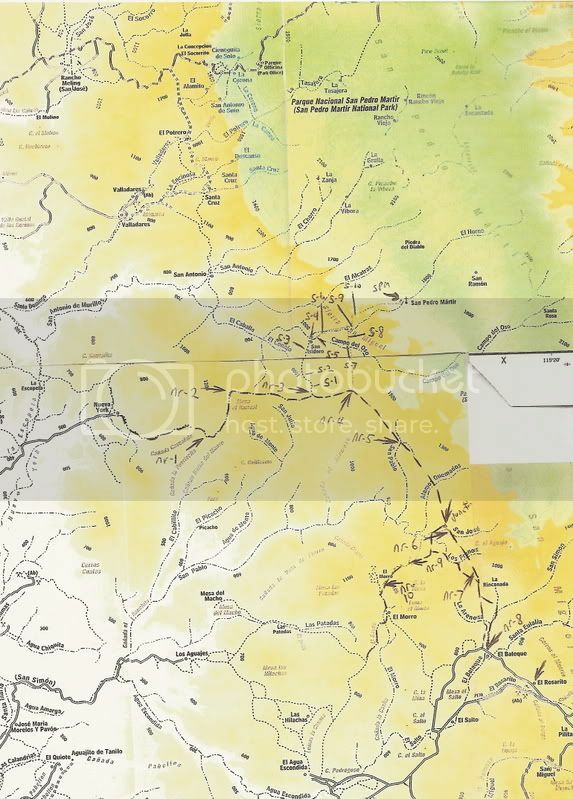 By the way, the old Atlas shows only a trail from Nueva York to San Isidoro, as did the 2003 Almanac. Wonder if the 2009 Almanac has these new roads? 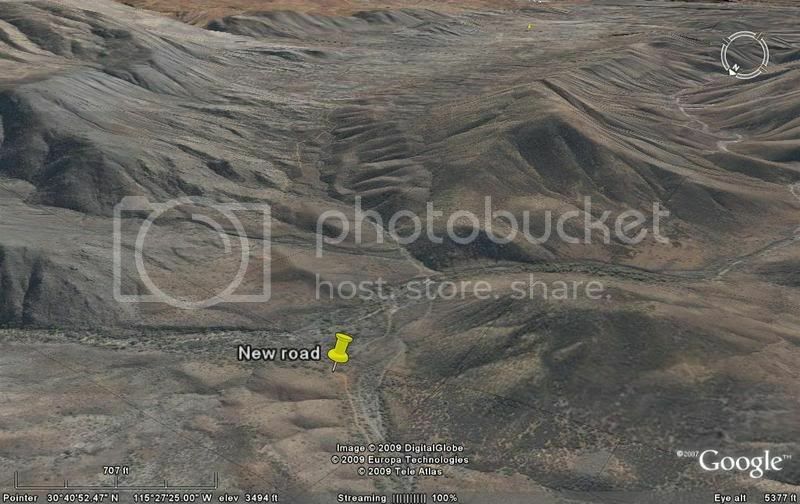 Has anyone been on this new mountain road? Excellent work, David. I love this stuff!!! 10-4 on that! Good to hear from you Cristobal! Please post any trip reports... You like going to the high country between San Ignacio and Mulege too, right? Yah, in the summer I would like to drive it... a huge new to explore part of Baja! I haven't been in that area since the mission trip...Its very interesting botanically---you've got the SPM Juniper Oak Woodlands meeting the last vestiges of foothill chapparal and Calif. coastal scrub meeting Blue Palm canyons meeting the beginnings of the Central Desert vegetation. of course its just plain fun exploring too. We're trying for a SPM trip in June...don't know if we'll have time or means to make a second leg further south but I'm getting giddy to explore that area again...maybe even hike up Arroyo Grande this time---with all the rain it could be verdant. David K. When it comes to La Baja I don't think anyone can hold a candle to you! Keep it coming Brother! 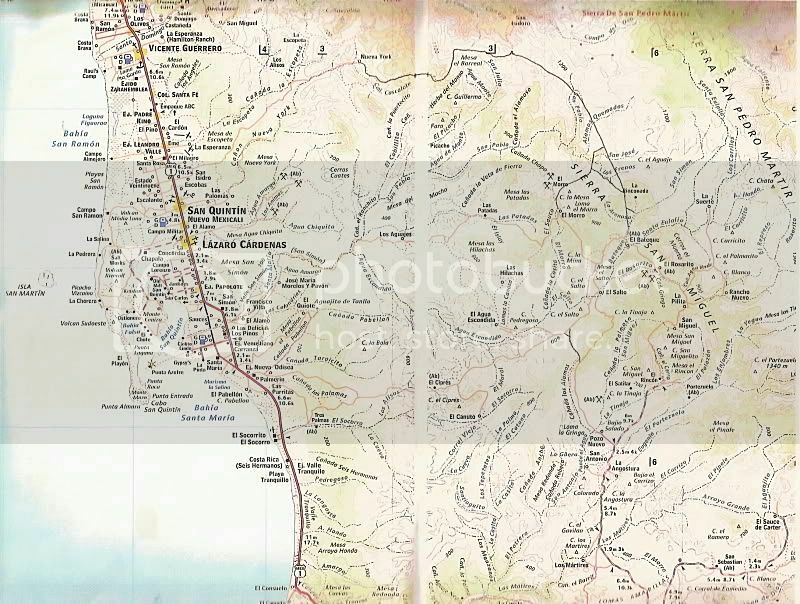 I saw this road in the Baja Almanac and was fascinated that there might be a different route to Mision San Pedro Martir. 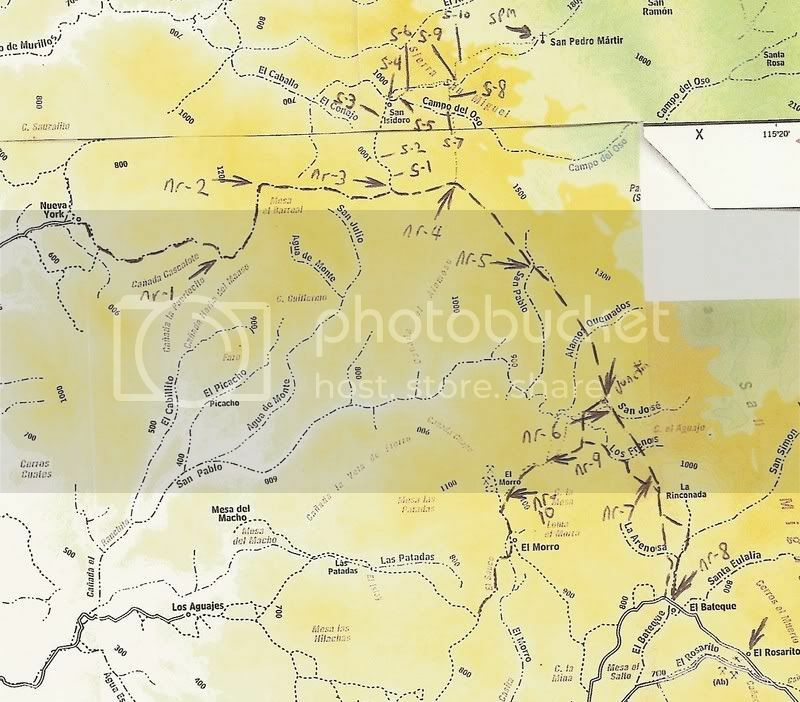 After hours of staring at the map and imagining the possibilities, I convinced a friend to spend Memorial Day weekend poking around the backcountry. Vehicle was a 1995 Toyota 4-Runner with 32-inch BFG Mud Terrains, rear locking differential and a mild suspension lift (thicker springs and torsion bars). As it turned out, it required every bit of my truck�s capability to make it through. Spend the night before camped in the hills east of San Quintin, clear of civilization and out of sight of Highway 1. We started east shortly after sunrise the next morning. Except for a three mile stretch in the middle which required 4WD, the road to Nueva York was easily passable by a 2WD pickup truck. Along the road, we came upon a rattlesnake soaking up some sun. Nueva York was either a part time or abandoned rancho. The few structures we saw were made of poles, sticks and palm fronds, good for keeping out the rain but offering little protection from wind or cold. There were several cattle hides stretched out on wooden racks. No persons were present. There were several short side roads around Nueva York. After taking each one and discovering that none went more than a mile from the rancho, we were ready to head back. 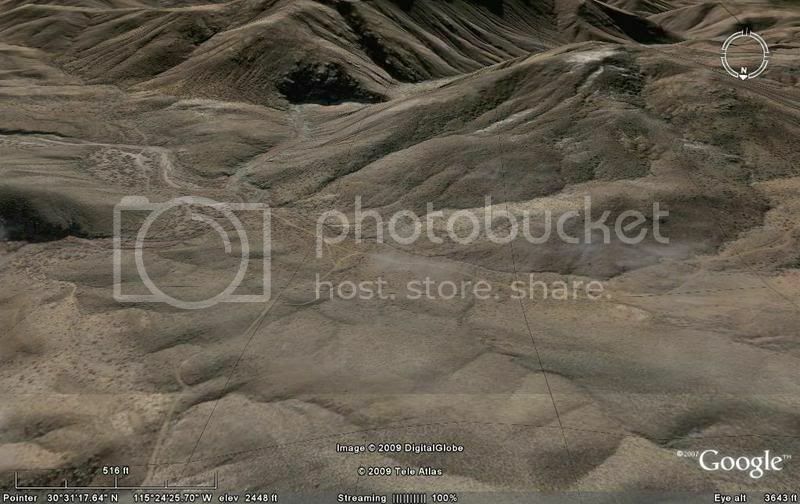 As I looked east and squinted, I saw what looked like a graded road cut into a hillside. Looking through binoculars confirmed what I saw, however we could see no road that led from the rancho to the graded road. The only way to this road was through a flat and somewhat moist field with some medium-size rocks that we had to dodge. This would be our first of several areas we would have to cross to get to the continuation of the trail. The road cut into the hillside was fairly rocky but passable. After maybe two miles, the road disappeared altogether and became a series of intermittent trails barely passable to a vehicle. There were so many areas where we had to stop and walk as far as 1/8 of a mile to find where the trail started up again. We spend more time out of the vehicle looking for the trail than moving forward in my truck. There were stretches where I could have used a chain saw. A skilled spotter was a must as there were numerous obstacles where it took the exact right tire placement to get through. Each time we got past a particularly challenging obstacle, I would wonder if we would make it back out when the time came. After several hours of rock crawling, tilted trails, overgrown vegetation and stream crossings with high banks, all of which resulted in bottoming out and tail dragging, we reached the end of the trail. Here are the coordinates (degrees/minutes/seconds) and altitude where the passable portion of the trail ended: N 32 42 04.2 W 115 36 51.6 3300 feet MSL. It was clear that this was the end. The area was a very small box canyon with 5 to 10 foot walls. There was a circle of rocks and firepit that had probably not been used for years. I also noted a respectable amount of faded beer cans. There was no way even a motorcycle could continue. The only ways forward from here are by foot or mule. Either way, I think it would take a skilled trail finder and capable rock climber to reach the mission. Getting out the way we came in was just as challenging. Things looked totally different from the opposite angles. Obstacles that we cleared going down were much harder going up, especially out of streams. We did not get back to San Quintin until an hour after dark. It took all the daylight a late-May day had to offer (over 13 hours I believe). As every experienced backcountry traveler knows, when the sun goes down it is very difficult to navigate. At the end of the day, my truck�s sides were pretty scratched up. Sumac bushes were the biggest culprits. But is was worth every scratch. I think we were lucky. I would not do this route alone again. Nor would I imbibe, something that rounds out the whole Baja backcountry experience, taking it from excellent to perfect. You are basically out there in a very remote part of the peninsula with no backup. Looking back, we probably pushed a bit too hard with my truck. There were many obstacles that we barely got past. And the tilt of some areas could cause a lifted vehicle to roll. To this day, the Nueva York route, as we call it, remains one of my two favorite Baja California side trips, the other being San Juan de las Pilas. For me, the feeling of sheer remoteness is the greatest appeal. There were no power lines or other signs of civilization, other than wheel tracks and the occasional faded beer can. Even Baja cow pies were few and far between. To me it felt even more remote than the Maze District of Canyonlands National Park. I have never felt so isolated in my life than I did east of Nueva York. One cannot put the feeling into words. The area is wild, even by Baja California standards. If you are after remoteness and unspoiled scenery, then this is the place for you. Oh man, now I really wanna go! Nice report there 56mm. One thing about summer David--it can be blistering hot out there...not always though--if there's a good marine layer at the coast it might not be too bad. My first experience in this area was driving to Meling Ranch and the observatory many years ago. Scenery begins as one starts the climb out of the San Telmo valley. It was Spring, and the area had experienced a wetter than normal winter. The hillsides were green with yellow flowers. I imagined that this was what the inland valleys of San Diego County looked like 100 years ago. 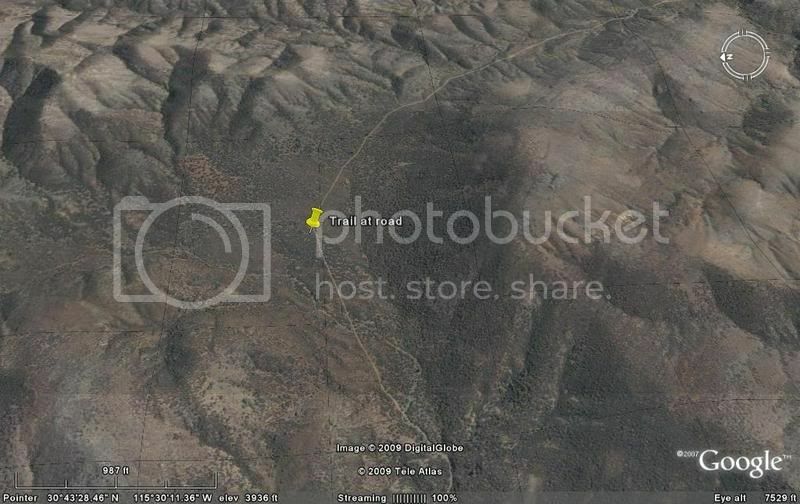 I think alot of Baja aficionados blow past the western slopes of the Sierra San Pedro Martir for places further south. The old rule that the real Baja doesn't start until El Rosario drives us to do just this, and the axiom may not be completely true. 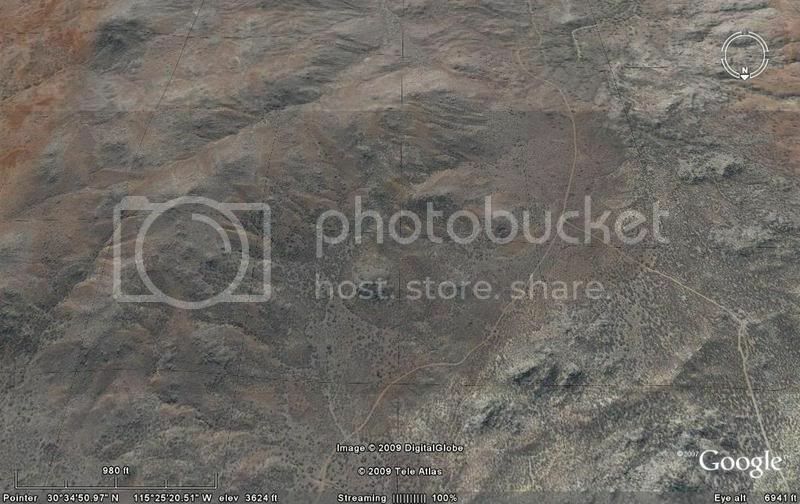 IMHO, this area may be the best part of Baja north of El Rosario. David, thanks for finding this road. I now feel like I have to go down there. I think it�s doable over a four-day period: Leave San Diego Friday morning, spend Friday night camped somewhere east of Nueva York, explore Saturday and Sunday, spend Sunday night in El Rosario, and drive home Monday. Still have mixed feelings about this road. On one hand, the area is now accessible to vehicles, which will certainly bring more people into the area, not usually a good thing. On the other hand, the accessibility allows me to further explore this area. My selfish side hopes that the recent rains did some damage to the road, which will hopefully discourage visitors. So only the most determined Baja lovers will go. When I was there nine years ago, it felt like we were some of the few gringos that had ventured into the area. Even so, we barely scratched the surface. That feeling will draw me back. If you think it may be too wet up there... join us at Santa Ynez Saturday morning! David, thanks for the maps and the invite. One day I would like to join you all on one of your trips.